The Museum of Science and Industry (MOSI), located in Manchester, celebrates the cities achievements in the fields of science, technology and industry. This beautiful Museum is one of Manchester’s historic and most popular attractions. MOSI was where the Rethink Fashion Show, by Recycle for Greater Manchester, was presented, in 2014. Award Winning show, Rethink Fashion, showcased an unusual catwalk whereby outfits worn by the models were created from ‘upcycled’ products and materials, such as plastics, paper clips and linen. The fashion show encourages people to make the most of their wardrobe by possibly thinking about ‘upcycling’. 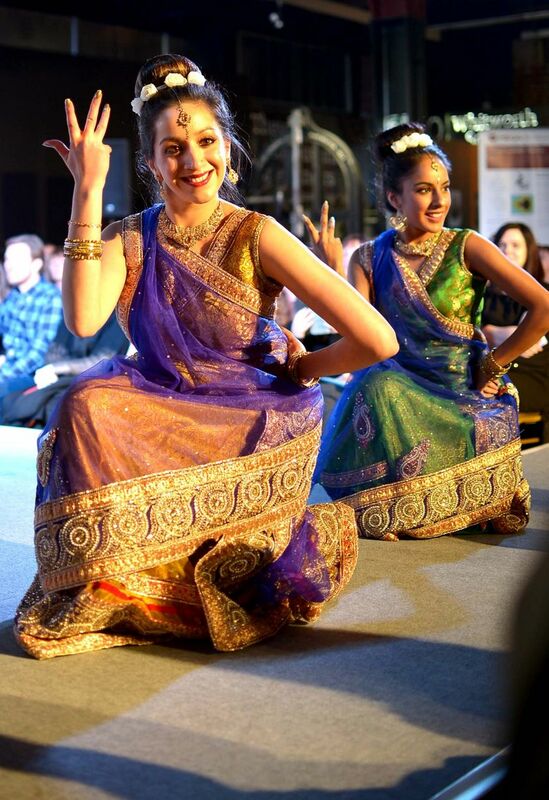 Included at the event were stalls, interactive stalls, exhibitions and an Indian Dance Troupe … From multi-award winning Ri Ri’s Dance Academy, of course! All four of Ri Ri’s female Asian dancers were adorned in gorgeous and authentic Indian outfits, called Chanya Choli and worn in a Gujarati style. With flowers decorating the hair and pretty Indian jewellery to match the clothing, each of Ri Ri’s dancers had a different coloured costume, illuminating the catwalk with not only the graceful dancing but enhanced with the elegant Gujarati dance costumes, too. The Academy performed one ten minute Performance which reflected the ‘Mehndi scene’, complemented by the classic and rhythmic Henna songs, such as Mehendi Hai Rachne Wali, from the 2001 Bollywood film, Zubeida – Giving the creative event an insight into conventional Bollywood dancing, fused with components from Bharatanatayam (Indian Classical) dancing. The Manchester Evening News (MEN) covered the event. Click here to read more information and see photographs from Ri Ri’s Dancers. City Centre Voice also wrote a Blog featuring Ri Ri’s Dance Academy.